Welcome to August's Meezer Musings! As August gives way to September I'm a day late getting this newsletter out but the last couple of weeks have been challenging and I needed an extra day to finish up a few bits and pieces. 'Bits and pieces' is actually quite a good description of Meezer Musings this month as it contains various, unrelated topics. In last month's newsletter I mentioned that one of the most frequent questions I get asked is about cats peeing where they ought not to pee. A fair proportion of the emails I receive, though, are from people wanting help in identifying their cat's color, type or breed. Siamese color and type (type refers to a cat's body shape) are both fairly easy to tell from good photos, although photo exposure and screen display can distort a cat's color so photos will not always give you a clear answer. There are possibly some additional questions that will need to be asked, for example whether the points are brown-based (seal or chocolate point) or gray-based (blue or lilac), and what color the paw pads are - paw pads being the deciding factor in many cases where coat and points don't tell you what you want to know. ... not a Siamese cat? A tougher question is "is my cat Siamese?" This question arises a lot with cats adopted from shelters and rescues, and the reason it's difficult to answer is that much depends on the expectations of the questioner. Many people seem to have a need to know whether the cat they've rescued is purebred or not, and "does my cat look Siamese?" is not the same question as "is my cat a purebred (or pedigree*) Siamese?" Cats may have Siamese coloring and look Siamese but this alone doesn't make them purebred - one of their parents might have been the local tom! Siamese coloring - the cream coat with darker points that we're all familiar with - comes about through the presence of the Himalayan or Siamese gene together with associated modifier genes. These genes are inherited, so a cat that looks Siamese will have Siamese ancestry, but without a pedigree certificate (an official family tree listing parents, grandparents, great-grandparents etc. of a kitten) it's not possible to say that a cat is a purebred Siamese, whether it looks like one or not. And rescue cats tend not to come with official papers. But cats with Siamese coloring possess many of the characteristics and personality that purebred Siamese cats are known for, and make just as good pets, so you don't need the paperwork to have a cat that's probably just as intelligent, loyal and affectionate as their purebred cousins. *A purebred cat is one whose ancestry contains only cats of that breed. A pedigree cat is one whose family line is recorded through several generations, but may include ancestors of different breeds. I've come across several articles recently warning about the dangers to cats and dogs of non-steroidal anti-inflammatory drugs (NSAIDS) in pain-killing creams. These follow a US FDA warning about the dangers of one substance in particular, flurbiprofen, which is found in a number of topical pain-killers. This post, by vet Dr. Karen Becker points out the dangers of these and many other substances commonly found around the house. It's a comprehensive article so do please go and read it. And then, if you use any of these pain-killing lotions and potions yourself, please take great care to wash your hands after using them, before stroking your pet. On a similar topic, there are sadly still far too many people who don't know that eating any part of the lily plant is highly toxic to cats - we covered this in an earlier newsletter so if you weren't aware of the dangers of lilies, you can read about them here. And please spread the word to any other cat-lovers you know. 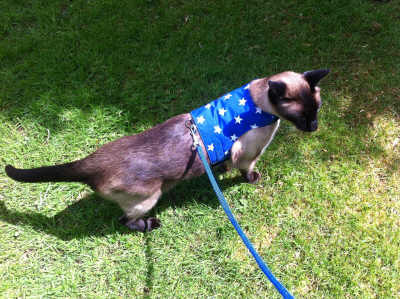 If you've been following us for a while you may remember that last June I wrote a piece about cat safety that included the harnesses made by Butterfly Cat Jackets. I bought Bandit a standard small cat harness (first picture, left) seven years ago when I first got him so that I could take him outside without losing him. This didn't work out too well as he managed to wriggle out of it several times, and in addition I found it very difficult to fasten. As you can see, they're a lot more robust as well as being safer and more comfortable for the cat. 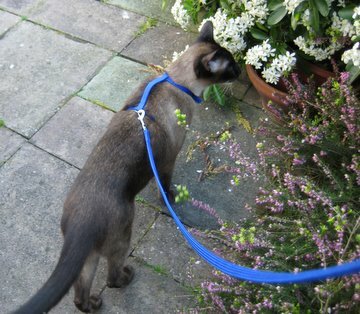 The straps are wider and less likely to cut into the flesh if the cat pulls away from you, and have Velcro closures making them easy to fasten, easily-adjustable and quick-release once you're safely back indoors. Bandit has never managed to wriggle out of this jacket. 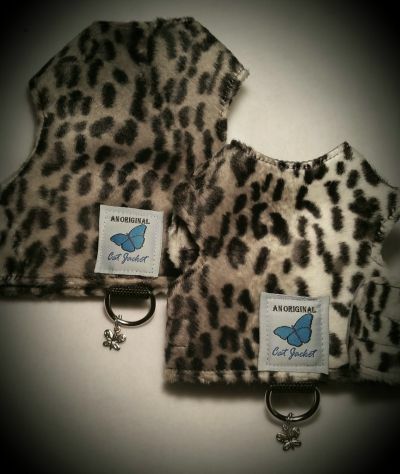 They have a new website (www.butterflycatjackets.com) where you can see all the different patterns they produce. I'm thinking of buying a faux fur one like this for Bandit. I hope he'll like it! I first 'met' Madeleine Purslow in a Siamese Facebook group. Maddie, as she's known to her friends, is a writer and the author of two very different novels - although if you choose to read them both, you'll find that there is a slight connection between them! Maddie shares her own life with no less than four Siamese cats (Queen Theda, Gideon, Gilmour and Persephone) so it's no real surprise that her latest book features a Siamese cat or two. Moon Diamonds: A Siamese Cat Story is about an actress, Monica, whose memory starts to fail her at crucial times. For a professional who relies on her memory for work, it's a disaster. Deciding to retire rather than struggle on, Monica wonders how she'll ever fill her time but her love of Siamese cats comes to the rescue. To say any more would spoil the story so I won't - but I will say that I thoroughly enjoyed the book and would have loved it to go on for longer. The characters are very well-drawn, and Monica's dealings with the breeder from whom she gets her second cat are a joy to read, and so true to life. It's gentle and funny and poignant and sweet, a perfect book for Siamese cat-lovers. 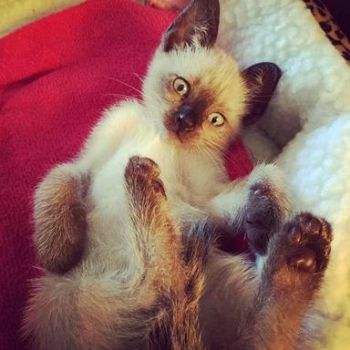 Our August Meezer of the Month is kitten Jazzmin. Her owner, Donna, lost her long-time companion Lucy Rose earlier this year and wrote a memorial for her. Donna missed Lucy Rose enormously and felt the need to bring a young Siamese into her life again; she returned recently to update us on her search. Jazzmin was the result and Donna says "the house is brighter and her life and energy are lighting everything up around her". You can read Jazzmin's story here. Isn't she adorable? One of this month's most popular photos (easy to see why!) 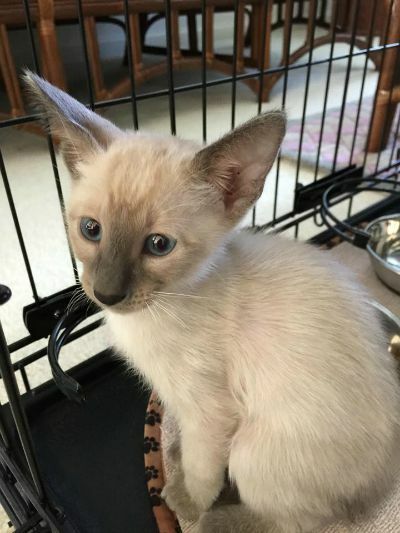 was this one of kitten Anubis who recently found a new home with Kymberly Adams-Kennedy and her other Siamese cat, Horus. Both cats are named after Egyptian gods. Welcome to your new home, little sweetie! That's it for us for August. Today as I write (Monday 31st) it's a public holiday in the UK. True to form for the day it's pouring with rain! Bandit is most upset and is hiding under the bedclothes! For anyone who's been on vacation this month it's back to work, and back to school for our kids, too. A change of seasons and the start of autumn - or perhaps spring if, like some of our visitors, you're in Australia or New Zealand or elsewhere in the southern hemisphere.